We're hesitant to recommend this sheet set due to its rigid 30-day return policy and its mixed reviews. However, the price is attractive and the product comes in many different sizes, colors and prints. If you appreciate these positives, go for it. What Is the California Design Den Everyday Series Sheet Set Made From? 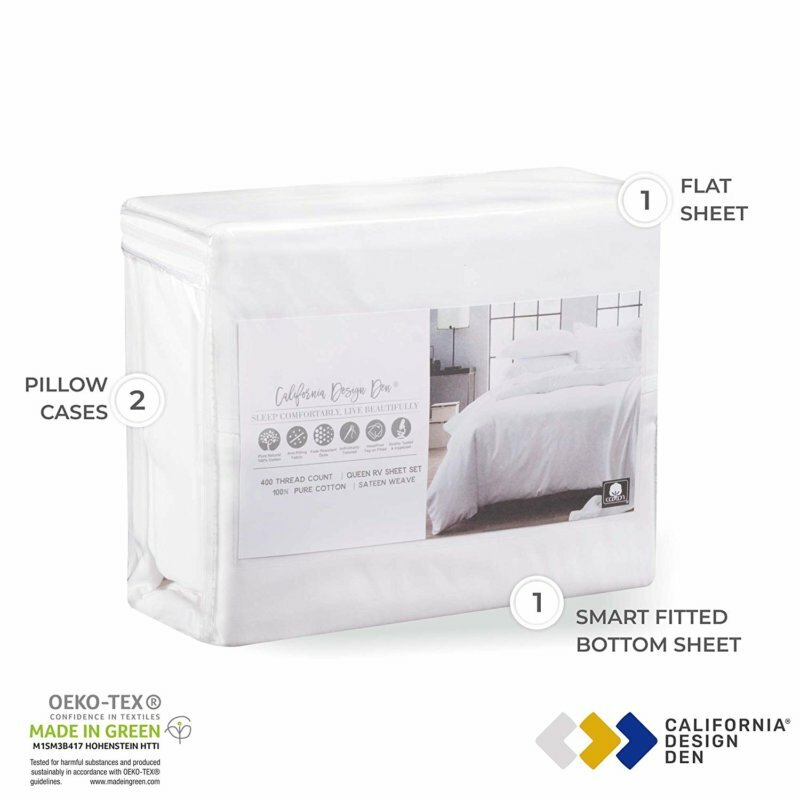 How Does the California Design Den Everyday Series Sheet Set Perform? How Do You Wash the California Design Den Everyday Series Sheet Set? How Much Does the California Design Den Everyday Series Sheet Set Cost? The first thing that struck us upon researching details for this review is the curious inattention to detail that California Design Den displays when it comes to their brand and product names. First, the brand name may lead you to believe that their bedding items are made in California—or at least somewhere in the US—but they’re actually manufactured in India. California Design Den’s co-founders established NMK Textile Mills India Pvt Ltd over a decade ago. It’s still the factory that produces the brand’s bed linens, as well as other bedding products sold by several top US retailers. Second, the sheet set we’re reviewing is referred to by California Design Den by two different names: Everyday Comfort Series and Everyday Luxury Series. On the official brand website, it’s also referred to as the “Internet’s Best Selling Cotton Sheet Set”. We’ve decided to call it the Everyday Series here at Good Night’s Rest. Are these California Design Den sheets really worthy of the title “Internet’s Best Selling”? Do they feel like everyday comfort and/or everyday luxury? Let’s find out together. The OEKO-TEX certified sheet set features a 400 thread count sateen weave, made from 100% pure natural long staple cotton with single ply yarns. Stitching is accomplished with three-ply threads. California Design Den further notes that each piece is individually worked on by skilled artisans that do all the measuring, cutting, stitching and inspecting by band. The sheets also go through a process called bio-polishing that enhances the fabric’s smooth texture and prevents pilling. The Everyday Series sheet set is available in the following mattress sizes: twin, twin XL, full, short queen, queen, king and California king. You can choose from 14 different solid hues, and if you want something different, you can also get one of their seven different prints—like the Antique Rose Light Blue pattern seen below. What Are Short Queen Mattress Size Dimensions? The short queen is also known as the RV queen, as its most common use is to be fit into a trailer home or recreational vehicle (RV). The short queen mattress measures 60 inches by 75 inches, usually about 10 or so inches deep. The difference between a short queen and the standard US size queen mattress is about five inches, lengthwise. Worth noting that California Design Den’s RV queen sheet set does provide the correct dimensions for its fitted sheet, but comes with the same size flat sheet—90 inches by 102 inches—that they provide for standard queens. What Does OEKO-TEX Standard 100 Certification Mean? The International Association for Research and Testing in the Field of Textile and Leather Ecology calls itself OEKO-TEX for simplicity’s sake. Their Standard 100 certification is an assurance of consumer product safety, as well as sustainable and responsible manufacturing practices. This certification was introduced in 1992, and can be awarded to components—like fabrics or yarns—or ready-made final products like sheet sets. OEKO-TEX checks for the presence of banned and harmful chemicals, and also follows several globally recognized guidelines. Examples of the latter are parts of the US Consumer Product Safety Improvement Act (CPSIA) and the EU’s Registration, Evaluation, Authorisation and Restriction of Chemicals (REACH) regulation. Apart from product checks via lab tests and other measures, OEKO-TEX also includes routine on-site visits to factories. Certified products must have all parts considered and checked. For example, a sheet set must have everything from fabric to elastic to print pattern dyes meeting OEKO-TEX standards. What’s Included in the California Design Den Everyday Luxury Series Sheet Set? Like most sheet sets, expect one flat sheet, one elastic-inclusive fitted sheet, and two pillowcases. Twin and twin XL sheet sets come with only one standard size pillowcase, while the rest come with two. King and California king sheet sets come with king size pillowcases (21 inches by 40 inches) instead of the standard size (21 inches by 30 inches). Fitted sheets also have slight size variations. 15 inches deep for twin and twin XL and 16 inches for the rest of the sheet set sizes. Curiously, they’re said to be a good fit for even very thick mattresses. The 15-inch pocket fitted sheet will fit up to a 17-inch thick bed, while the 16-inch pocket will fit up to an 18-inch one. There’s also a size indicator tag on each piece, and a smart tag on the sheets that tells you which side is which. How Does the California Design Den Everyday Luxury Series Sheet Set Perform? Currently, these sheets enjoy a 4.5/5 average rating on Amazon with over 3,500 customer reviews. Similar to the Mayfair Linen Egyptian Cotton sheet set we reviewed earlier, customer feedback for this California Design Den product is all over the place. Most of the reviews from verified customers are positive, but there are some that are not—and the complaints are consistent. When it’s good, it’s good. Satisfied customers praised the breathability, crispness and sturdiness of the sheets; as well as the fit over the mattress. The bad reviews are very bad, though. Some issues that keep on being mentioned: Stains and discolorations after the first few washes, itchiness of the fabric, color inconsistency from product photos to actual items, and problems with fit. Both positive and negative reviews mentioned that the sheets are prone to wrinkling. We were puzzled, but we did find something that may explain the differences in consumer experiences. Some customers mentioned that they were repeat buyers of the sheet set, and that their old sheets were of a higher quality than the new ones they got later. It may be a case of a bad batch or two, or some old or damaged inventory that was sent out accidentally. Is the California Design Den Everyday Luxury Series Sheet Set Hypoallergenic? 100% cotton that is not chemically treated is as good as hypoallergenic. 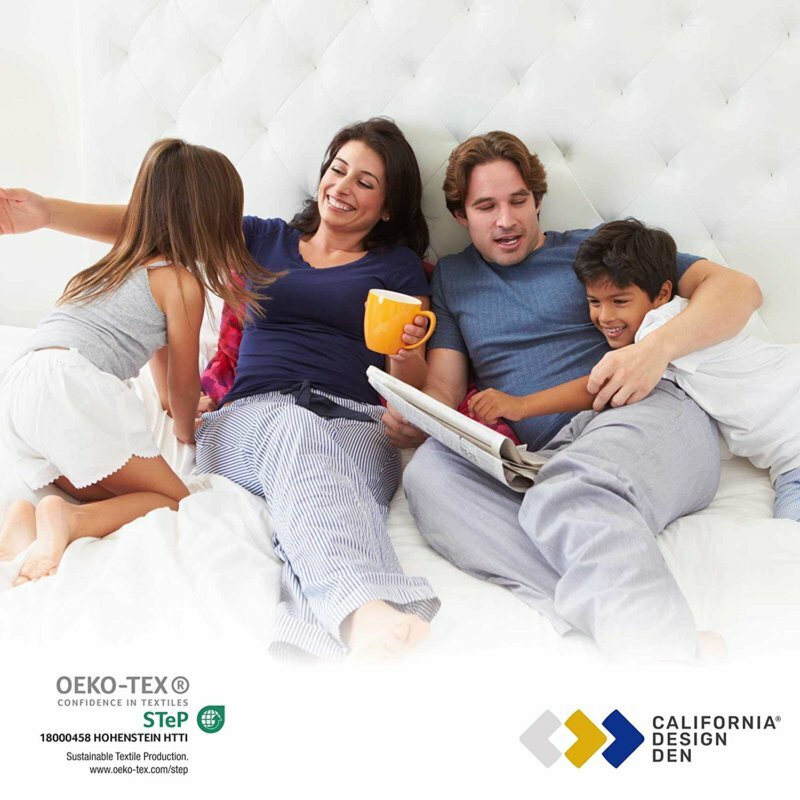 Combine that with the OEKO-TEX certification and it’s not a stretch to say that this sheet set is allergen resistant. Inconsistent customer feedback notwithstanding, all signs point to yes. 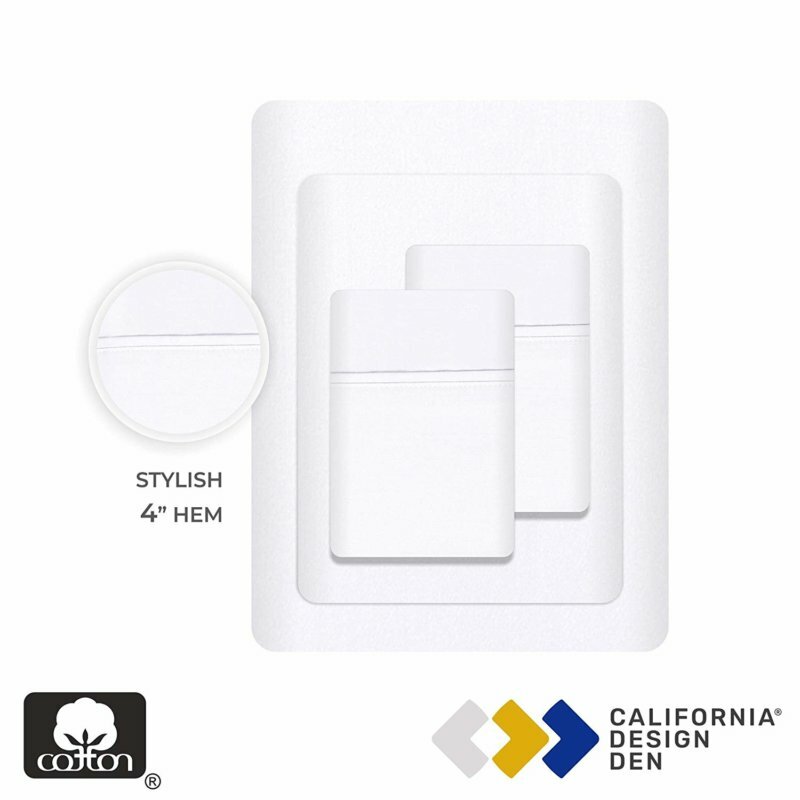 As an editorial note, we here at Good Night’s Rest would like to add that it was very easy to research California Design Den’s company and product information. We also noticed that their customer response team is very much active on Amazon. This transparency is not common for companies that don’t care about how their products perform. While these details don’t really speak to the actual quality of the product, it does speak to the quality of the service the company wants to provide. Does the California Design Den Everyday Luxury Series Sheet Set Smell? A smattering of reviews mentioned an unpleasant smell right out of the packaging, but it was not a common complaint. Again, it’s worth noting that it’s not just the fabric that’s OEKO-TEX certified—it’s the whole ready-made product. This includes the dyes used. Any smell could be attributed to the packaging and or the way it’s shipped or stored, but we’ve checked and confirmed the safety certification. How Do You Wash the California Design Den Everyday Luxury Series Sheet Set? These sheets are machine washable. Set a warm and gentle cycle and then tumble dry on low. If needed, use only non-chlorine bleach. Other things to note: Most sheet sets specify a cold wash cycle, but California Design Den specifically says warm and gentle. You may also press these sheets using a warm iron. How Much Does the California Design Den Everyday Luxury Series Sheet Set Cost? As of this writing, one queen size California Design Everyday Series Sheet Set in pure white is available on Amazon for $38.99. 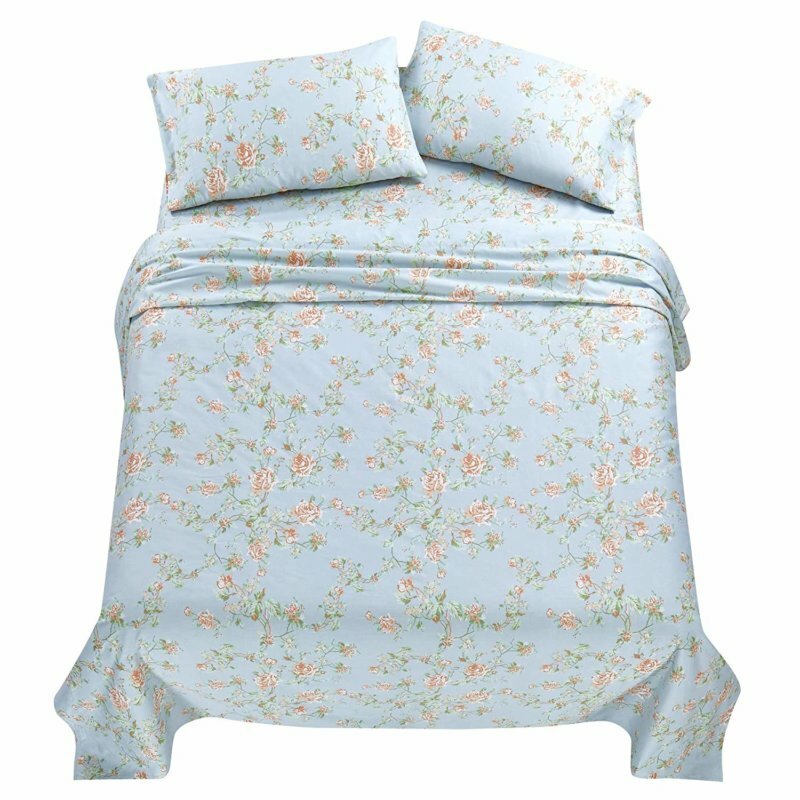 Again like Mayfair Linen, the price is dependent on which color or print you pick. Size availability is also an issue. Not all colors and prints are available in all sizes, and vice versa. 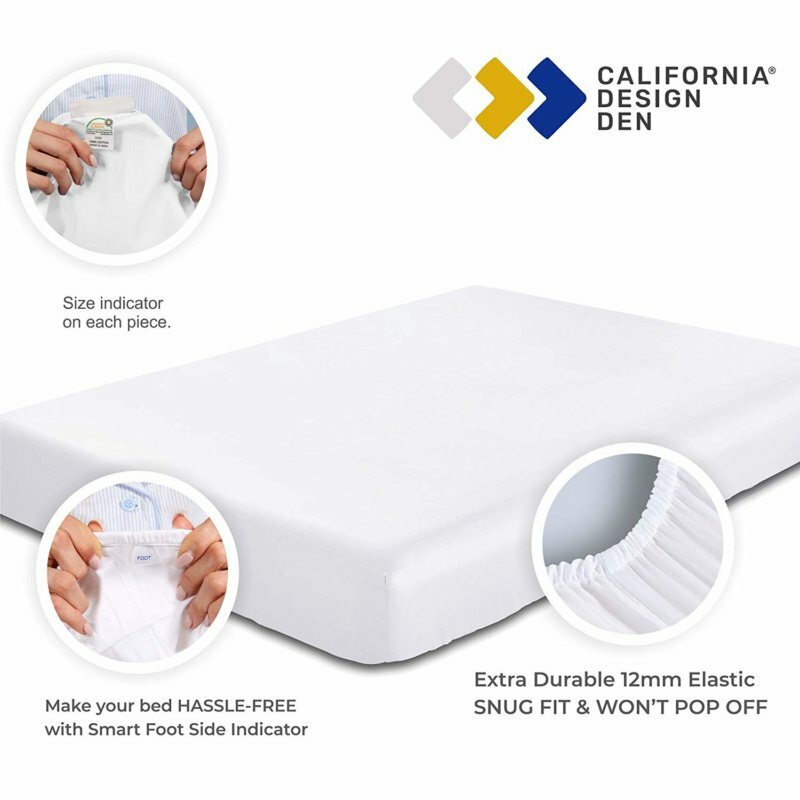 Does California Design Den Offer a Trial Period, Return Policy or Warranty? Both their official website and their Amazon product pages mention their 100% Satisfaction Guarantee. California Design Den promises quick customer service replies and conflict resolution. What this guarantee translates to is actually just a standard policy that necessitates that you contact the brand or the supplier within 30 days for exchange or return. Refunds will be processed but return shipping will be deducted from the original cost. Only items still unused and in original packaging are qualified for a refund. Find California Design Den Sheets Deals Now! We’re hesitant to recommend this sheet set due to its rigid 30-day return policy and its mixed reviews. However, the price is attractive and the product comes in many different colors and prints. California Design Den even offers an unusual size: the RV queen. If you appreciate these positives, go for it. We do love the fact that it’s a fraction of the price of many luxury sheet set options, without the typical sketchy 1000+ thread count promises. As we mentioned above, the print options are also something we appreciate. Many more expensive counterparts offer only solid colors, and most only neutral tones. We’re not crazy about the wildly differing customer experiences, but at this price point, we feel like it’s an acceptable risk. Just call customer support first thing if you don’t like it when it arrives.